The EasyStart 366 Soft Starter (Board-only) For Manufacturing By Micro-Air, Inc. Please Note: The EasyStart 366 is meant for OEM applications. Given its lower cost and higher complexity, Micro-Air will be unable to provide detailed technical support to DIY customers for single installations. Thank you for your understanding. EasyStart is the perfect solution that allows an air conditioner or refrigeration compressor to operate on a generator, inverter, or limited utility power when it would otherwise not have functioned. It can also be applied to air compressor and fluid pump motors. The EasyStart 366 is available in two models. The X05 model is capable of supporting up to a 36000 BTU ( 3 ton) compressor. The X06 model is capable of supporting up to a 72000 BTU (6 ton) compressor. 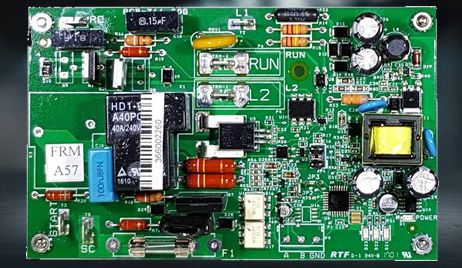 The start capacitor and enclosure are not included (board-only), thus providing a substantial cost savings, but they must be provided by the installer. IMPORTANT INSTALLATION NOTE FOR CRUISAIR® MARINE CUSTOMERS ONLY: When installing EasyStart into 220-240V SMX A-288/282/281 control applications that use the triac to switch power to the compressor, it is necessary to replace the triac with a relay. If the triac is not replaced, the EasyStart and any pump relay triggers may suffer damage and ultimately fail. 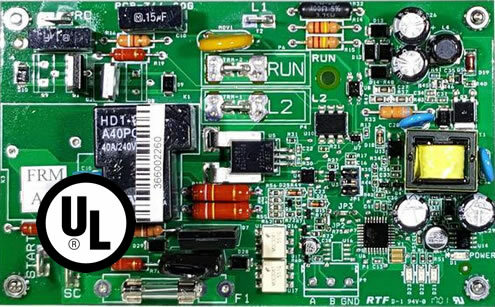 A replacement relay specifically designed for this application is available at this link. Please note that this is not required for 115V SMX applications, and the triac is still safe to use. I made an extensive search on the internet for single phase soft start controller for my sea recovery water maker. Yes, Sea recovery sells one but have you seen their price? I was impressed by this Microair product line and the customer support is fantastic! All my questions answered in great detail and very timely. I ordered the board version and installed it but I ran out of time to test it last weekend. The installation was made easy by excellent documentation and drawing Microair created for me. I am looking forward to updating this review once I've tested and measured start amperage. So far great company, outstanding customer support, product look like it will be perfect for the application. The EasyStart™ 366 Soft Starter - It works! EE since 1970 and started to design my own. When I came across the 366 board decided I couldn't make one for that. Installed it in a Dometic 15000 BTU RV AC. Peak start current( .1 sec avg) before installation was 45 amps, after 15.5. Generac IQ2000 started ac no problem. Two thousand watt pure sine wave inverter also ran ac. Outside temp was 76F. Long story short: I have my camper A/C running for $500 when the cheapest 3500 watt inverter I could find was $600+. In this instance the 366 was a great value for my needs. I have an older popup camper, a 1999 Jayco, and the AC needed the motor replaced. I didn’t bother for the first year I owned it. This year I decided to drop the $100 into the motor replacement kit and found the compressor still works great and the unit now blows ice cold. Bought myself a super cheap Sportsman 2200 watt max/1800 watt running inverter generator on WalMart special for $299. Dropped in a hard start cap when I was replacing the fan motor and (not surprisingly) found this generator would not start the compressor in my Dometic 13500 BTU A/C. Turned off the 12V converter, removed all other loads, still no dice. So then I did some research and decided to give the 366 a shot. I’m an systems engineer so the install wasn’t much trouble for me. Wired it in (took about an hour), gave it the 5 starts on utility power, and this little generator now runs the A/C. Even with the camper’s 12V converter running! I toggled economy mode on and off while the A/C was running and, as expected, it made no difference since this A/C should draw about 12-15 amps while running.